Recall the golden years of aeromodelling with these pictures of engines used for control line model aerobatic planes in Australia. 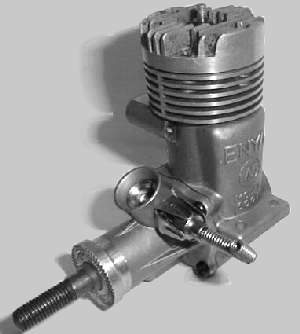 Engines from all over the world found their ways into control line aerobatic models in Australia, and some established themselves as particularly successful in competitions. This page shows a few of them. By clicking on any one that interests you an enlarged version will appear. 1. 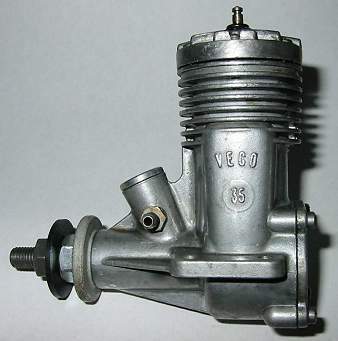 The Anderson Spifire spark ignition engine featured prominently amongst the winners when aerobatics (or stunt) competitions first commenced at a national level in Australia. 2. From the mid 1950s onward, Japanese made O.S. Max 29 and 35 engines enjoyed a string of successes. 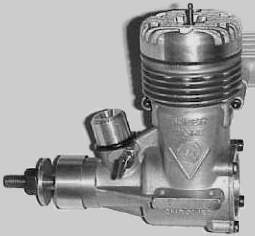 The two engines were similar in appearance, but the porting of the larger 35 was considered to provide greater flexibility in power output, making it more suitable for stunt. Australian agent for OS, Tony Farnan, for long preferred to use the smaller 29, to show that it was faster than a 35; he once won a nationals with a 29 powered Thunderbird to prove his point! 3. 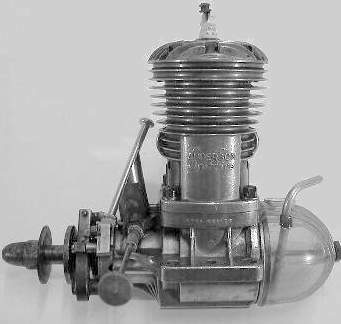 Merco of Britain produced some motors that became popular for stunt work in Australia during the 1960s. This picture shows the 35 model, fitted with muffler. Doug Harlow, the 1960 nationals champion at the height of his powers, caused a stir amongst supporters of O.S. by choosing a Merco 35 to power his new Comanche... which went on to win the next nationals. 4. 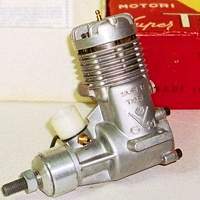 This Fox .35 Stunt engine is typical of the economically produced American range. Regarded as one of the least powerful of 35 engines, the Fox 35 nevertheless has powered Australian nationals winners on a couple of occasions. Fox produced bigger engines too, with its 40 and 59 models winning as well. 5. The Veco 35 from the USA is well known as the engine used by famous American stunt expert, Bob Palmer. Not many of them were seen in Australia, but they did win a couple of nationals in the hands of Peter Smith. 6. During the 1960s leading stunt fliers came to believe that bigger models with bigger engines provided an advantage. The Enya 45 was one of the bigger engines available around that time, and it was tried with considerable successs. 7. From Italy comes a huge range of well made engines bearing the Super Tigre brand, and from the late 1970s on these have dominated the results of aerobatic competitions in Australia. 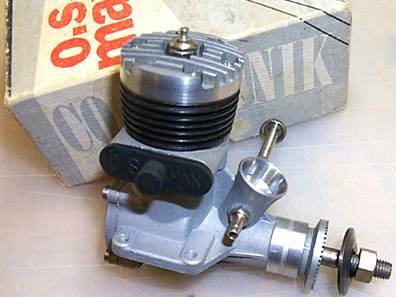 This picture is of the .46 cubic inch sized model, the one that has achieved the greatest popularity as a stunt engine. 8. Another Super Tigre to feature prominently in competition results is the 60, pictured here with its muffler attached. What makes a good stunt engine? I personally like motors which will give a good 4/2 stroke run with only a small difference in power between the 4 and 2 stroke, enough to keep a fairly constant speed in manoeuvres and that will perform well on straight fuel. This means a fairly conservatively timed motor with venturi size, prop, fuel (oil content), plug and compression adjusted to achieve the required run. Motor size per se is not important to me except that the motor must provide adequate power for the model. Most of the motors used around the world for stunt in the 60s couId do this. I really liked the Veco 35 and only stopped using it in the early 70s when mine went over the hill and no spare parts were available (after all they were discontinued in the mid 60s). All I could get at the time (mid 70s) was a ST46 which I also found to be an excellent motor for me. Both give good 4/2 stroke runs. I now have acquired two good Veco 35s (one essentially unused from the US and the other my Nats winner refurbished) and am considering building new models to suit them. I believe that in the right model they would be as good as any other motor for the way I fly. Interestingly, after my 68 nats win I wrote to K&B (Veco makers under contract who had by then recently taken Veco over completely) asking if they intended making more of the Veco 35s again as I wanted more. They replied yes they would be and would let me know when they were available. In fact they did not make any more but produced the K&B Series 75 instead. I have one and it runs very well but with a Dykes ring is almost impossible to start by hand. Can't turn it over fast enough to get pressure behind the ring to form a seal with the liner. Starts instantly with an electric finger! As for the stunt motors on the market today, I am sure that set up correctly in the right model and used by the right flyer most if not all could be used to win a world champs. The pilot is really the determining factor. Sticking to 4/2 stroking motors I would go for a Stalker 4/2 because of its relatively light weight and rear exhaust which would allow a better looking model to be built, size not really a determining factor but would probably go for a 46 or 51. Developed November 2002 by David Kidd. Your Webmaster is Ron Chernich.